GRAPELAND – The Grapeland Noon Lions Club welcomed three new members to the club during their meeting held on Thursday, Aug. 3 at the Grapeland Café. Danny Wolf, along with Beth and Mark Heidemann were presented for membership and were unanimously approved for induction into the club. Wolf is from the McKinney area and had been a member of the McKinney Lions Club. M. Heidemann is the meat market manager of the Grapeland Brookshire Brothers while B. Heidemann is a retired accountant. “If you have any questions feel free to ask me or any other members about anything,” Lions Club President Mike Goolsby said. Prior to the member inductions, Goolsby provided club members with an update on upcoming projects and events. “In old business, the Spot Vision testing we announced at our last meeting will be coming up during the week of Sept. 11. We are still waiting on the actual date but we should get that later this month and have it ironed out,” Goolsby said. On Thursday Aug. 17, the Lions will participate in the “Meet the Teacher” night at the Grapeland High School Commons. The event will be held from 6 p.m. until 7 p.m., Goolsby said. He encouraged all Lions who were able to participate in the event to arrive at approximately 5:45 p.m. to help serve ice cream. As he continued, Goolsby said the community wide clean-up days were scheduled for Saturday, Aug. 5 and Saturday, Aug. 12 and passed around sign-up sheets for members to sign. “We need to get as many of you as we can to sign up, especially this weekend. This will be a heavy weekend and hopefully next weekend will be stuff that people forgot,” he said. Goolsby said the club had access to three trailers and would be responsible for collecting the unwanted items east of the railroad tracks. After the trailers have been loaded, the crews will return to the City Park to unload the items into designated bins/areas. “We will pass through areas once at 8 a.m., once at 10 a.m. and then probably make another pass after we eat lunch. That should get everything we have for that day. We will do the same thing on Aug. 12,” he said. As the meeting continued, Goolsby brought up the Peanut Festival. “I spoke with a member of the Grapeland Chamber of Commerce board yesterday. They are trying to figure out a way to increase parking for the vendors at the Peanut Festival,” Goolsby said. “What they wanted to do was, in effect, buy our parking lot by the railroad tracks for whatever we typically collect that day,” he said. He explained if the club averaged $1,200, the chamber would give the club that amount and the club would not be responsible for the parking. “South of where the old roping arena is at the City Park, there is also parking. They asked that we have a couple of people over there to collect $3 apiece for individuals to park there. Basically, it would be to move our parking lot from the railroad tracks to over there,” Goolsby explained. He said while it sounded good, there was more to the chamber request. The second part of the chamber’s request was for the Lions Club to set up at the main entrance on Market Street and collect $1. Goolsby said he would talk with the chamber more about the matter but expressed unless it got a lot better, the Lions would probably pass on the offer. The club approved changing the signature card to reflect the new slate of officers. 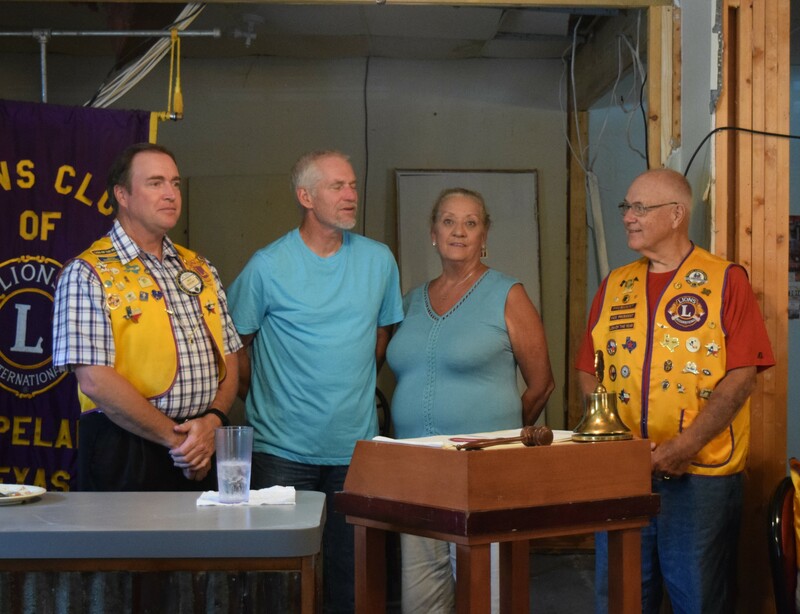 It was announced Lions District 2-X3 Governor Joe Holman would speak at the Aug. 17 meeting of the Grapeland Noon Lions Club. It was also announced U.S. Rep. Kevin Brady would be speaking at the Moosehead Café on Aug. 9 at 12:45 p.m.